Paddlers of all sorts have benefitted from the resistance training provided by rowing a boat through water for millennia. Today, we are fortunate enough to study the benefits of doing these exercises, and the results have shaped up well. Rowing works the muscular and cardiovascular system in symmetry. In fact, it’s a full body workout. Rowing not only builds muscle, muscular strength, and stamina but also helps shed weight. Your muscles will burn, your heart will pump, and your body will sweat. What makes this total body exercise so revolutionary is the sheer benefit to damage ratio it offers. Rowing lets the body work for extended periods of time at high intensity with minimal impact to joints, bones, and ligaments. This means you can get a workout without the rest of your body suffering. How do you get the fitness found in Olympic rowers when you have no boat, body of water, or time? Hop on a rowing machine. 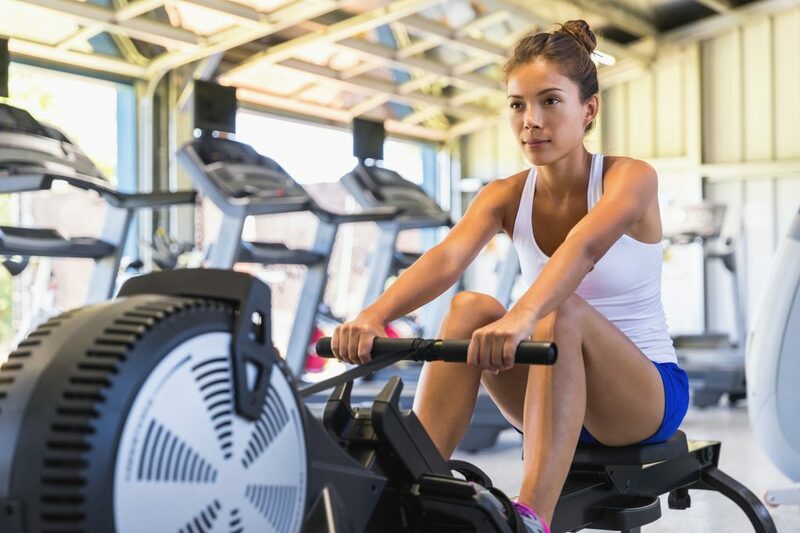 Here’s how to properly and effectively use a rowing machine to avoid injury and strengthen your muscles and cardio alike. If you’ve ever rowed a boat by yourself or seen someone do so, you know that it takes constant repetitive motion. Such is the case when using a rowing machine. Be prepared, as you will be burning from top to bottom when executed correctly. It is important to note that rowing machines come in different variations and should be used according to the instructions provided for each specific machine. While all rowing is relatively the same, some machines differ from others and these differences should never be ignored. Let’s get into how to use a rowing machine. First, situate yourself on the rowing machine so that you are symmetrically balanced on the seat. It is crucial you have a solid seating position that is centered as it should be to avoid injury and imbalance. Extend your legs out forward and place your feet beneath the straps looped over the foot pad and adjust to fit your foot and shoe size. Ensuring that the straps are placed across the balls of your feet or aligned with the top of your laces, adjust the straps to hold your feet securely to the foot plates. There should be no play in this region as you will be using your feet as anchors to the machine so that you do not slip off. With your feet planted, select the type of race, game, distance or time you want to achieve during your row from the ROW ViGOR app – you wouldn’t want it to be boring! Next, grab ahold of the horizontal handle. Now it’s time to row! Let’s dive into the key body parts you will be using and how to maintain proper posture and form while rowing. With the handle in your grip, hands shoulder with apart and feet planted firm and torso positioned at twelve o’clock, tighten your core muscles, hinge for at the hips to one o’clock and push of through your heels keeping your feet fully connected to the foot plates. While doing so, once the legs are just about fully extended and the hands just reach above the knees, lay back slightly to eleven o’clock with core still engaged, and pull the handle toward the sternum in a rowing manner. Simple right? Well, there is much more to it than just pulling till you’re tired. With each stroke you take, make sure you are taking full and proper breaths. Give your lungs and muscles the oxygen they need to fire away. Now, drive with your heels to extend the legs and then engage the arms. As you pull back, keep your body level and smooth engaging each bicep equally and transferring that pull into your deltoids. Simultaneously, your hamstrings and glutes should fire – equally transferring the push into your quads. When performed correctly, you should see an explosion of leg extension driven through the heels, followed by an even arm pull, all while keeping your posture straight and tight. Beginners, don’t fret. The muscle memory will come with experience. Your biggest concern should be keeping your form on point, with your motions being controlled, smooth, methodical and keeping shakes and flails minimized. Your elbows should flare outward slightly to maintain flat wrists, and your gaze should be straight ahead. With proper form and technique, it’s time to start your journey to not sure what this means. This can vary drastically for everyone as each individual has different strength and stamina levels. The important thing is to keep your form and push those muscles not accustomed to rowing so they memorize each rhythmic call for muscle firing. Work on your technique until you develop a steady balance of muscle burn. Once you feel certain that all muscles are adequate for more lengthy and intense rowing, increase your speed and/or time spent rowing. This is the level that will really push your cardio and give you all the benefits rowing has to offer. With each muscle working together like a machine, set yourself up with timed races, distances, or patterns to really give you a dynamic workout. While there are tons of methods, everyone is different and it is up to you to choose a workout that fulfills your body’s calling. Whether it’s from home or at the gym, you don’t need a boat to gain the benefits rowing has to offer. Your body will burn from the top down, and that’s the way you should want it! Now that you know how to use a rowing machine, you can get limber, warm, stretched and hydrated and get yourself on a rowing routine today. Head over to ROW ViGOR to stay up to date on all the rowing info and join the community of others who have found strength in rowing. Your body deserves to look and feel its best, feed its potential! Subscribe to get all the latest news and special offers.